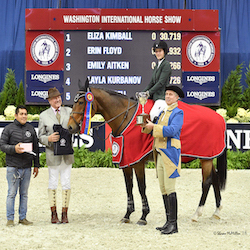 SUMMIT, NJ, October 2, 2012 – eyeDä has been named the official identification sponsor of the Washington International Horse Show (WIHS) for the second year in a row. The show will occur October 23-28 in Washington, D.C., with eyeD enrollments available to exhibitors during the veterinary inspection process. "We are pleased to showcase this cutting-edge technology once again. eyeD offers something unique in safety and security for horses and we welcome the opportunity to be able to share it with our community of fans and friends at the Washington International," said Bridget Love Meehan, executive director, Washington International Horse Show. The eyeD solution is secure, easy-to-use and accurate. It provides a non-invasive option for horse owners, veterinarians, associations and event regulators to identify horses and manage equine information. The technology is more accurate than tattoos or markings and more secure than paper documents, offering an easy alternative to the complication and uncertainty of traditional identification methods. eyeD utilizes the unique features of the animal’s iris to establish an identification code. A digital photo, called an eyePrintä, is taken of each of the horse’s eyes using a special camera. The images are electronically stored along with photos to pedigree registrations and medical records, among other information. Because no two irises are alike, an eyePrint is more accurate than a fingerprint. As the country’s premier equestrian metropolitan indoor horse show, the 54th Annual Washington International Horse Show is a world class event and Washington institution. In one of the week’s highlight events, the Grand Prix, Olympic champions and top equestrians vie for their chance at the President of the United States Perpetual Cup, the only equestrian trophy known to carry the Official Seal of the President. For more information about the Washington International Horse Show, log on to www.wihs.org. Global Animal Management is a wholly-owned subsidiary of Merck and Co., Inc. For more information about eyeD, please visit www.eyeD.com. Like us on Facebook at www.facebook.com/eyeDsolution or follow us on Twitter at www.twitter.com/eyeDsolution. An equestrian tradition since 1958, the Washington International Horse Show brings top horses and riders from the U.S. and abroad, including Olympic champions, to the nation's capital to compete for more than $400,000 in prize money and championship titles. More than 500 horses participate in show jumping, hunter and equitation events during the six-day show. Highlights include the $100,000 President's Cup Grand Prix, a World Cup Qualifier, where top competitors, including Olympic medalists, vie for the President of the United States Perpetual Cup; the Puissance high jump competition; and WIHS Equitation Championship Finals featuring the country's top junior riders. Special exhibitions, boutique shopping and community activities will round out this family-friendly event. Since its debut, the Washington International has been a Washington, D.C., institution attended by presidents, first ladies, celebrities, business and military leaders, as well as countless horse enthusiasts of all ages. Washington International Horse Show Association, Ltd. is a 501(c)(3) nonprofit charitable organization headquartered in Washington, D.C.